Finding the right present isn't a quick job, however, this original gift basket could be just what you were looking for. For that someone special who enjoys being comfy in their bed with teddies as well as indulging themselves with luxury Lindt chocolates prepared with the delicious and irresistible recipes. You’ll make the celebration unforgettable! 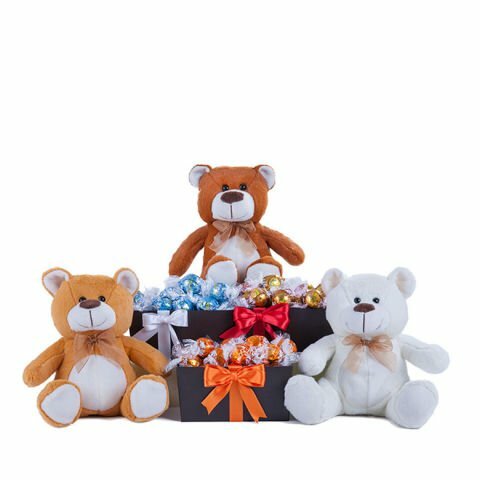 3 teddy bears for a special occasion, kindness, love and joy. Lindt milk chocolates (200g) presented in a box adorned with a red ribbon. Delicious Lindt dark chocolates with hints of orange (200g), presented in a box adorned with an orange ribbon. Lindt stracciatella chocolates (200g) for those in pursuit of the most exquisite and original pleasure, presented in a box adorned with a white ribbon. Can you imagine that special someone cuddling three teddy bears? Or simply enjoying the immense pleasure of savouring Lindt chocolates prepared with delicious and irresistible recipes.